Over the weekend, Russia has decided to block Ukraine’s access to the Sea of Azov from the Black Sea; it’s placed a cargo ship under the Kerch Strait Bridge, which Russia completed earlier this year to give it direct land access from Russia to Russian-occupied Crimea, and Russia has military helicopters orbiting above the bridge. The Kerch Strait is a bit under 2,000 feet wide where the bridge sits. Exxon Mobil Corp is throwing $1 million at the move to produce a national carbon tax. Exxon’s move is an attempt to manage what it sees as the risk of a similar movement in the US, in ways that it hopes will simplify requirements on its industry…. Exxon sees a carbon tax as an alternative to patchwork regulations, putting one cost on all carbon emitters nationwide, eliminating regulatory uncertainty…. On the contrary, Exxon is looking for short-term competitive political advantage at the expense of long-term economic—real—advantage. That’s unfortunate. The Federal government is continuing its ethanol mandates in its misguided effort to clean up the fuel our cars burn as we get about our business. In an op-ed earlier this week, The Wall Street Journal rightly decried the artificial, government-created and -propped up market in RINs, which oil refineries can trade around in order to get credit for ethanol that they’re unable to obtain and blend into the fuel they produce. As the WSJ noted, one of several outcomes of this artificial market is this. The core problem is that the federal government has distorted the energy market by using subsidies and mandates to support biofuels. The Trump administration’s Bureau of Land Management is moving to rescind and replace an Obama administration regulation that would drastically limit methane gas emissions by companies drilling for hydrocarbons on Federal land. While the move is salutary—the Obama regulation would have imposed too much cost, would have stunted energy innovation, and would have limited energy supply with resulting higher prices to us consumers—there’s one tidbit in the Wall Street Journal article carrying that news that needs emphasis. Environmentalists rejected that claim [of impeding energy development] and decried the decision, pointing out that several companies had already moved on their own to start cutting methane emissions. Here’s one estimate of the cost of converting internal combustion vehicles to an all electric fleet. Certainly, it’s a single datum, but it’s a useful one as an outer bound, plausibility estimate. Nicola Sturgeon is Scotland’s First Minister, and she wants to replace all of Scotland’s internal combustion vehicles with electrically powered vehicles by 2032, which lends irony to the outer bound datum. Great Britain’s green energy aficionados want to replace all of Great Britain’s internal combustion vehicles with electric ones by 2040. Professor Jack Ponton of Edinburgh University has rudely run the numbers [emphasis in the original]. 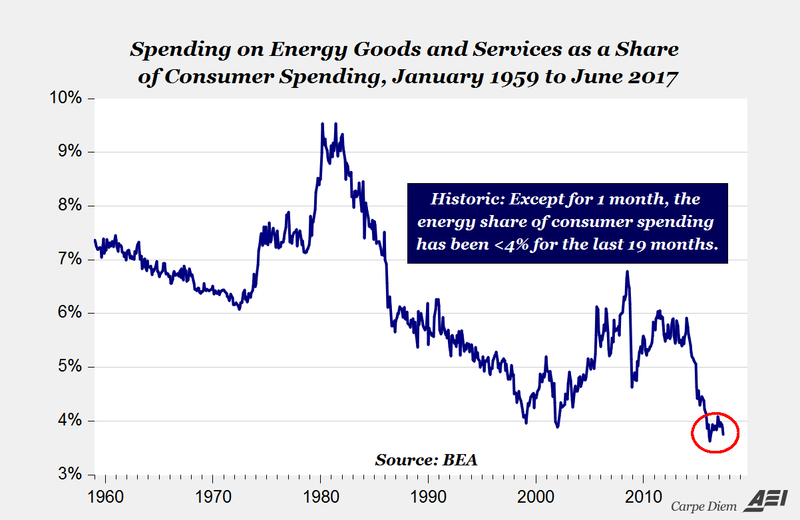 In 18 of the last 19 months starting in December 2015, the energy share of consumer spending has been below 4% marking a historic period of the most affordable energy in US history (annual data on energy spending back to 1929 confirms this). That’s evil oil and gas for you—making our lives easier and making that ease cheaper. …of the failure of government intervention in “green” energy. And of the lack of understanding of the problem by the participants. This four minute video via Deutsche Welle tells the tale. A group of Spanish farmers, in order to “improve their pensions and to do something for the environment,” banded together to build a solar farm, Spain’s biggest cooperative solar park, an operation of solar cell collectors at roughly €90,000 per module. [T]he modern facility is currently losing money because the conservative government has drastically cut the subsidies for solar power. In a move met by applause from at least one congressman, the Energy Department announced a pilot program for research into domestic mining of rare earth elements. Rare earths are minerals critical to computing technologies and to various military and civilian sensor technologies. China currently dominates the production and market for these elements, with about 85% of the world’s production from its domestic mines. Another major source for rare earths, not yet exploited, is the South China Sea floor. Part of the purpose of the PRC’s seizure of the South China Sea and of its island-building and militarization of those constructs is to control access to those rare earths and to reserve them for itself. My biggest disappointment is a majority in Congress ignored the will of the people. They ignored the interests of the people in coal country, they ignored the law and they put corporate money ahead of all that. Wow. Just wow. Because the people, exercising their will in electing the majority of Congress—all the members of Congress, come to that, every single one of them—had their will ignored when the majority that they elected executed on their will by rejecting a bad regulation.